Chester is at mid age and has lived a very active life. If his experience is like mine, things ache and are starting to wear out. I want him to live a long, happy, comfortable, active life so I thought it was a good idea to get him a joint support formula to help his little body out. I searched online for a really good joint formula and saw reviews on Phycox Canine Joint Support (affiliate link) that claimed it “reversed my dog’s aging”. According to one reviewer, “my 12 year old dog acts like a 2-year-old dog again”. Almost 80% of reviewers gave it 5 starts on Amazon. The reviews of 3 stars or less mostly state that it didn’t help their dog (nothing bad – it doesn’t work for every dog the same). According to the product, it is a “joint support formula to help reduce inflammation and discomfort due to normal daily activity”. I don’t know if Chester and Gretel’s activity level falls under “normal daily activity” for a small dog but I hoped Phycox would at least make a little difference. Phycox Canine Joint Support contains 158 mg of glucosamine, 140 mg of MSM, Omega-3 oils and a “natural pain inhibitor” similar to other joint formulas. In addition, these chews contain Boron and the proprietary Phycox© (phycocyanin, etc.). The instructions are to feed 2 chews a day (for a 20 lb dog) for 4-6 weeks to see a difference. After that a maintenance dose of 1 chew a day is recommended. 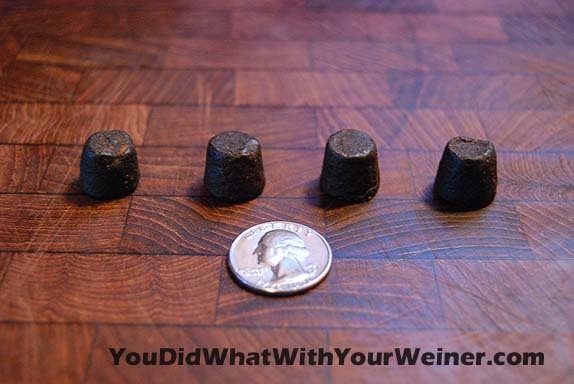 The price for a container of 120 small-bite chews is about $30. If used as directed, one container will last a 20 lb dog for an introductory, double-dose period of the full 6 weeks and then for about one month after that on a maintenance dose. I bought one container of the liver flavor. I found it to be really stinky but of course the dogs love, love love to eat stinky stuff so they gobbled them up. After feeding Chester the recommended dose for three weeks I did seem to notice he was more spunky on runs again – keeping up with or ahead of Gretel. However, I didn’t think it was a miracle like many reviews implied. I suppose glucosamine for dogs is like it is for adults – it’s more preventative so you won’t be as “degraded” later as you would have been without it. Knowing that, I am not surprised that I didn’t see anything groundbreaking anyway – especially because Chester is not decrepit. Three months have gone by since we started giving Chester the Phycox chews. I would say that I have seen a definite improvement in his mobility and energy. The improvement seems to have plateaued but I guess that is why you enter a “maintenance stage” – because improvements only get to a certain point and then stop. 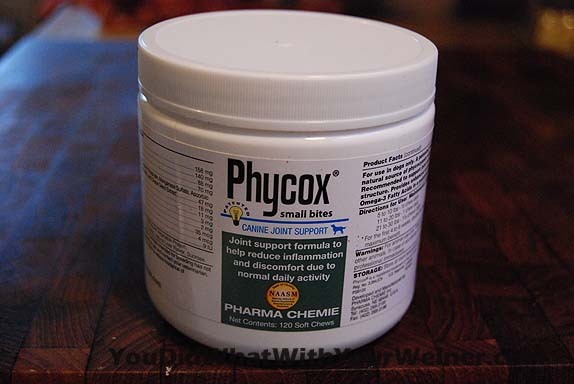 Am I convinced that Phycox Canine Joint Support (affiliate link) is the best joint support formula out there? No. But I feel like it is right up there with the best of them. I definitely might ad it to our rotation of other high-quality joint supplements like Glycoflex. Has anyone else used Phycox Joint Support? What did you think? Do you have a different joint support formula you love? We use a canine acupuncturist for our lab, and that has been a HUGE help for him. His had a chronic leg problem that flared up when he played too much, but after we started the treatment it went away and hasn’t been back since. It’s been about 2 years. I LOVE acupuncture…for me! It took , my back injury from half healed to what I would consider fully healed in about 6 months! If Chester ever had major back or joint problems I would give it a try for him for sure. Chester doesn’t have any issues (cross fingers) except slowing down a little with old age. I figured it was good to start on something preventative before things did start getting bad. thanks for the review. i’ve been needing to look into something for my 14 year old Kismet, I will give this a try. Funny, I’ve been giving Tag and Amber one of these chews daily since Tag hurt his shoulder at one of the Greenlake walks back in April. They don’t really like the taste of them, so I have to “help” them eat it by gently holding their mouth together until they chew and swallow it. Tag lost his limp within a few weeks of taking these chews. I highly recommend them! Thunder is still young, but since he is so big, we give him Omega 3 as a preventative. I am afraid that joint supplement would bankrupt us…lol. If you have to give 2 chews for a 20 pound dog, I guess Thunder would get 5x as many. I just wrote a long comment but it all disappeared when I was redirected from the site to register 🙁 Anyway, I use Joint Max Triple Strength, I was so obsessed with finding the right supplement I made a whole spreadsheet comparing products, reviews, research, etc. My senior dogs, 11 and 15, don’t have any problems with achey joints or stiffness, and I’ve been giving them supplements for many years now. When I’ve run out of it I notice a difference in Tessa’s mobility and willingness to be active or go up and down stairs, so I think it’s worth it. That is what I noticed with Chester – with the supplements he was more willing to go up and down the stairs and was faster and running and hiking. Is the Joint Max supplement just for dogs? That sounds like a people one? Hmmmm….I have never hear the yogurt one. My little Hazelnut (Teacup Chihuahua) has injured her back three times (jumping off the sofa). The vet suggested that we try the Phycox. Hazelnut ate them a few times….and then stopped, I don’t think she likes the smell or taste! I’m going to have to grind it up and mix it into her food. 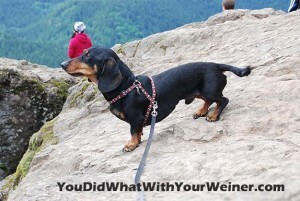 My vet just recommended this for my 9year old cocker spaniel. He has arthritis and has been plagued with seizures for the last 3 years. He loves the taste and I give him twice a day with his phenobarbitrol. I hope this helps him! My crippled old diabetic yellow lab definitely started moving better after a few weeks on Phycox. With the onset of freezing weather, however, he is slowing down again, and I am debating whether I should increase his dosage or switch to Phycox Max. Any experience to share in that regard? By the way, he LOVES the taste. I just say, “Stinky treat?” and he comes (almost) running, which is impressive for a dog who’s favorite althletic activity is “walking fetch”. I don’t have any experience with that specifically, sorry. I think increasing the dose would help but if the Max has an additional ingredient in it I would go that route instead. You could also try a different one for a while to see if it works. I hear one can stop working after a while so I like to change it up. We’re currently using Glycoflex Plus and like it. Great. I would love to know how Madison did on Phycox. Thanks for stopping by.